(Jon) The Isle of Pines was another place I could have spent a lot more time. 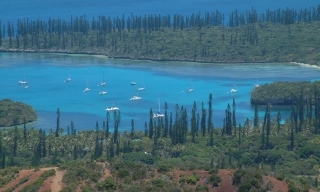 Since most boats have to check into Noumea before going anywhere else, getting down to the Isle of Pines is often difficult, as it's SE of Noumea - directly into the SE trade-winds. But we got a delightful (if sometimes dangerous) west wind and took advantage of it, flying the spinnaker for 70 miles in one of our best sails in a long time. 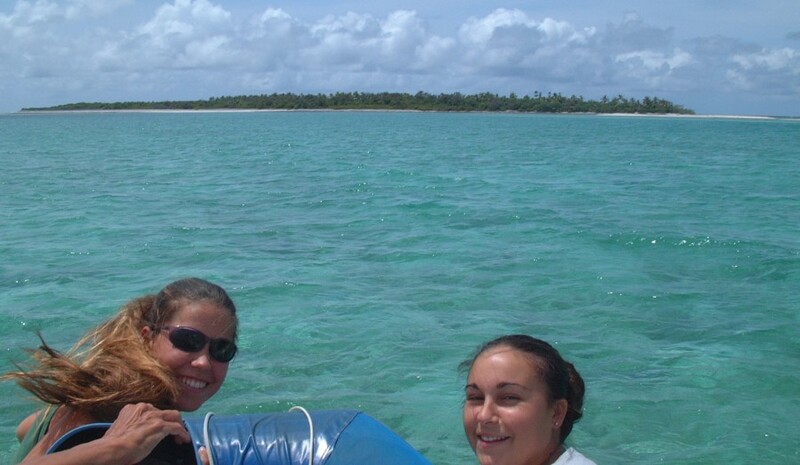 We decided not to anchor in the main anchorage of Kuta (which is completely open to the west) but instead went one bay further southeast to Kanumera, as it offers much better protection from the west-sector winds we were experiencing. Kanumera has a wonderful soft beach where we had a big yachty-potluck and it became our base of operations for several excursions. It also has ruins of the old penal colony and several walking trails nearby - around the headland to the west, up to Nga Peak, and around to the SE where they still build their dugout sailing canoes. 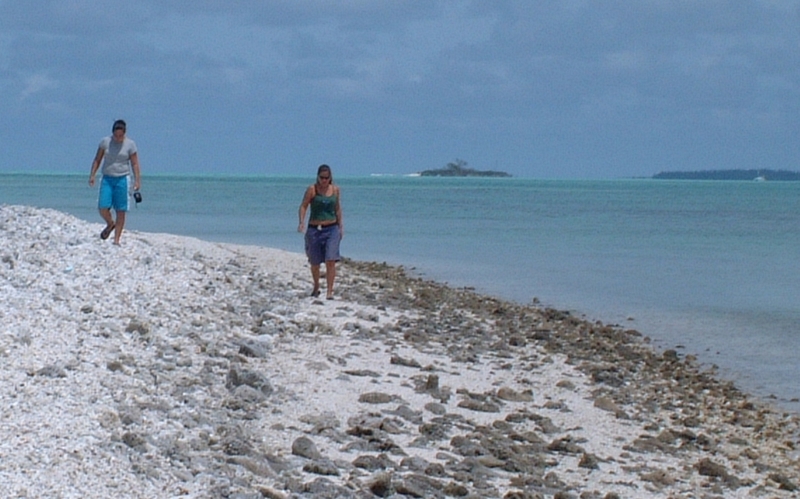 One of my favorite excursions was to the Nekanmue Atoll, at the very SE tip of New Caledonia. We had a nice SW wind and so a glorious sail to get there, and then when the wind switched back to the SE, we had a nice sail back. The pass through the reef is not at all marked and was a bit nerve wracking, but friends on a Catana 47' catamaran had gone in and said it was worthwhile. Much of the atoll is too shallow, even for Ocelot, so we did a lot of dinghy exploration, visiting all 3 islands and walking around their coastlines looking for shells. 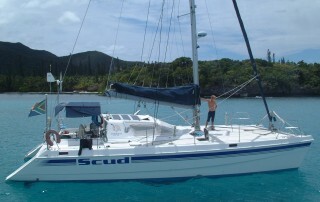 (Sue) We didn't begin to explore enough of the Iles de Pins or it's surrounding islets. I loved the hike up Pic Nga early in the morning (although Jon got better pictures by waiting and hiking mid-day), and the long tramp we took with Peter and Tina from Scud around the peninsula that separates Kanumera and Kuto Bays. 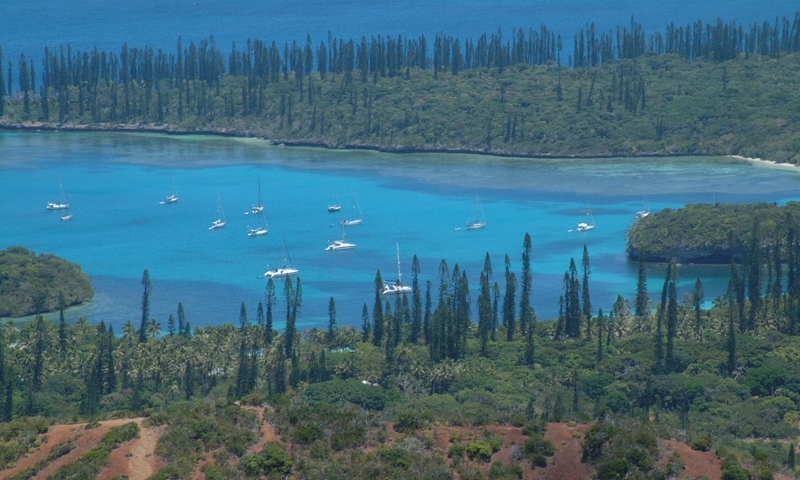 The red hills, pine trees, and blue waters make this a very picturesque area, and unlike anything we've seen before in the South Pacific. 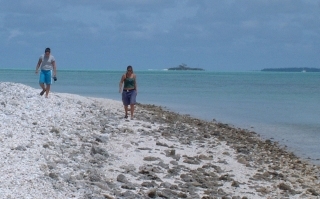 The visit to Nekanmue Atoll, SE of Iles de Pins was a sheller's paradise, with chambered nautilus shells on the sand, and gem quality (empty) eyed cowries lying atop piles of bleached coral that was the "beach". Silver gulls rested on the sands, and osprey guarded huge rough nests in the wind-blown shrubs. The trick was not stepping on any of the dozens of banded sea kraits that slithered amongst the coral rubble. It was truly a naturalist's playground! Another time, the four of us hired mountain bikes from the little resort there, and went all over our corner of the island. The paved road went a long way, and we could have followed it practically forever, but it was more our track to get to the off-road, off-trail dirty wild stuff. We lost Tia for a little while, during which time she went and had a bit of an incident with a tree, and she came back a bit scraped up. She just grinned, though, and we went to cool off in the ocean before returning the bikes - good thing we returned them then, or we would have had to pay for another hour that we thought we'd already paid for. I have to admit, sometimes it would definitely be nice to be able to speak and understand French perfectly. Still, that hour (or was it two?) bombing around the trails of the Isle of Pines was great fun.